Most U.S. Catholics have probably heard of St. Edith Stein, though many may know nothing about her except that she was a convert and died in a Nazi concentration camp. Some number will be aware that after her conversion — she was an atheist of Jewish descent — she became a Carmelite, taking the name in religion of Teresa Benedicta of the Cross. Those who keep up with the news would have noticed that her canonization by Pope John Paul II in 1998 was protested by Jewish organizations in the U.S. as well as Europe. The Catholics baffled by the protests against the canonization of St. Edith Stein did not understand, or preferred to ignore, that in Jewish eyes she was guilty of a crime worse even than preaching hatred of Jews. In truth, nothing can be more vilely “anti-Semitic,” though only a Jew can do it. It is for one of them to become Christian. That is a reality many Catholics today prefer to ignore because, in the immortal words of Rodney King uttered 10 years ago this past spring, they would rather “get along.” They have been encouraged in this by the post-Vatican II Church, or at least by high ecclesiastics of the kind who have been leading the Church during this period. Alas, the ecclesiastics can do nothing to change the attitude of those Jews who are not interested at all in getting along, but are very happy that Christians want to do so, especially if the Christians want it more than anything else — like, say, seeing Jews convert. Those of us who have come into the Church from one or another of the Protestant sects may know about the sorrow and bitterness that conversion can cause among family members and friends left behind. We may have seen a parent weep over what we have done. In most cases, however, weep is the worst a Gentile parent will do. It can be otherwise when a Jew converts. In this regard, this writer thinks of a convert of Jewish descent who is now a priest in a religious order, a convert whose story is known to numerous Catholics besides myself. When he came into the Faith, his father and mother took baby pictures of him and all the belongings of his that they had, piled them in the driveway outside their house, and burned everything. They never spoke to him again. I know of another convert of Jewish descent, a younger man, who is now preparing for the priesthood. As I understand it, his father also stopped speaking to him when he converted. Thank goodness, the two did reconcile when the father lay on his deathbed. What is striking is that the father reacted with indifference when a daughter earlier announced she had become a Buddhist. Did our ecumenical hierarchs think St. Edith Stein’s canonization could take place without the protests of organized Jewry simply because, apart from the Servant of God dying in a concentration camp, the Church no longer sought converts and, indeed, was even teaching, at least according to these Churchmen, that Jews can be saved without membership in her, provided they are “sincere”? How foolish. Why was it not noticed that the same Jews protesting against the canonization had never stopped protesting against the Church in general and Pope Pius XII in particular for “not speaking out strongly enough” against Nazi depredations during World War II? After all, those Jews knew perfectly well that St. Edith Stein and other Jewish converts to the Faith in occupied Holland were rounded up by the Nazis in a punitive operation in July, 1942, only after the Dutch bishops “spoke out” in a pastoral letter. In any event, this article is not about St. Edith Stein. Her story, as was said at our beginning, is known at least to some extent by most Catholics nowadays. Instead, we want to talk about other converts who were Jewish. Some, like two priest-brothers, Maria Alphonse and Maria Theodor Ratisbonne, and the second founder of the Holy Ghost Fathers, Ven. Francois Marie Libermann, were once very well known but are now generally forgotten — doubly so, if the obscurity into which they have been cast may be described in such a way. They are forgotten as individuals, and they are forgotten as a class, by which we mean the body of Catholics who were once recognized and cherished as Jewish converts. This in the same way that Cardinals Manning and Newman and other converts from Anglicanism used to be seen somewhat as of a body. Why are the Jewish converts forgotten? One supposes it is mainly because to recall them is to remember that the “ecumenism” prevailing since Vatican II did not always exist. That is, the promoters of the “ecumenism” prefer — so it seems — that no one should remember there ever were converts from Judaism, much less that such conversions were once not merely a matter for rejoicing but were actively sought — not least of all by the converts who are now forgotten and here will be remembered. We also want at least to mention that converts have included men and women who have never been very well known, but deserve to be. For example, in contrast to St. Edith Stein, how many have heard of Ludwig and Jenny Loeb, a Dutch Jewish couple who converted to the Faith after their marriage in 1906? Both died before the start of World War II, but such was the witness given by them that, of their eight children alive at that time, six had become Catholic religious — three monks and three sisters. All six were killed by the Nazis. There are Jews who have come into the Faith and, unlike the Loebs, were very well known or even world famous. It is the fact of their conversion that may not be known. They ought to be mentioned. An example is the French philosopher and winner in 1927 of the Nobel Prize for literature, Henri Bergson. When he died in 1941, France, like Holland, was an occupied country. He affirmed his Catholic belief privately, the Archbishop of Paris of the day, Cardinal Suhard, having decided that with the city under Nazi control, making publicly known the conversion of someone of Bergson’s stature could be hurtful to Jews as well as the Church. Towards the conclusion of this article, after the lives of some illustrious converts from Judaism have been sketched, if but briefly, we are going to turn to the touchy subject of “anti-Semitism.” Accordingly, we anticipate ourselves by registering certain points at this juncture, but it is nonetheless desirable to make them now. Apart from fearing that they will be so branded, leading Churchmen and many other Catholics will ignore Jewish intolerance because, like the recollection of forgotten Jewish converts, it violates the spirit of today’s “ecumenism.” Nobody is supposed to notice it is a one-way street. Another point: Without, I trust, inflating myself or seeming important in my own eyes, the present writer wants to put himself on record, not for the first time, as believing, as surely must every faithful Catholic, that racist anti-Semitism, like all racism, is absolutely wrong. Racism, like nationalism, is a modern substitute for God. The nationalist worships the nation instead of Him. The racist worships his genes. To say that is not to contend irrationally that differences between races do not exist. They certainly do. It is not racist to acknowledge the reality. Nor is it racist to prefer in given circumstances — to be prejudiced toward, if you will — the characteristics of one race to those of another. An Italian is different from an Englishman, and if I am decorating my home I should probably prefer the services of one to the other. I should certainly prefer his cooking. If I were looking for an office-manager, however, I think that other is whom I should want to interview. Do my preferences mean that one race is “better” than the other? Obviously not. Are the mountains “better” than the seashore? Only if I prefer to go hiking instead of snorkeling. To be sure, the characteristics that mark peoples do not always arise mainly, if at all, from their genes. Culture also matters. It matters so much that one of the principal characteristics of the Jew, who, having lived in diaspora in nearly all the lands of the world, lacks much of a culture of his own, is the degree to which his behavior will sometimes mirror the one that currently surrounds him. Sometimes his behavior can amount to a virtual parody. Who could have been more a Southern gentleman than the Confederacy’s Secretary of State Judah P. Benjamin still coolly smoking imported cigars and sipping fine port even as the Yankee bombardment of Richmond began? And a few years later which London barrister could have been more British than the same Judah P. Benjamin? With their country chateaux, vineyards and art collections, who could be more French than the French Rothschilds? Yet, something beyond culture and genetic baggage also matters. In fact, culture arises from it. We could call it religion except that it is the lack thereof which is often most conspicuously characteristic of Jews — so much so that “atheist Jew” is probably how best to describe members of the majority whether in Chevy Chase, Maryland, or Tel Aviv. Let us therefore speak of the life of the spirit instead of religion. Even atheism, after all, has its spirit. As between Jew and Gentile, the life of the spirit is radically different, or at least it has been. Political correctness may now dictate the denial of that, but there was no need in his day for Shakespeare to deny it. He made it the subject of one of the greatest of his great plays, The Merchant of Venice. Though we leave until later our reason for citing the great G.K.C., some explication of his language is probably here in order. First, he means “mean” in a sense we do not much hear anymore. He is not talking about Zionists being unpleasant or callous, though they may be that, but, rather, ungenerous in spirit, petty, narrow. Christians, in contrast, ought to possess the kind of generosity of spirit that moved the very embodiment of it, St. Mary Magdalene, to give herself entirely to Our Lord after giving too much of herself to too many men. Also, the Zionism of which Chesterton wrote is not that which usually comes to mind when we hear the term today: the modern Jewish movement to establish a Jewish state, preferably in Palestine, and even if the establishment must entail the displacement of hundreds of thousands of Mohammedan and Christian Arabs. In light of the widespread Jewish disbelief in the existence of God, let alone immortality (except in memory), Chesterton was thinking of the bleak notion of this world being all there is, of its having, in itself, Messianic significance. Make it perfect and the idea of Heaven can be put aside as the delusion it is. The Christian sees, of course, that belief in nothing but this world is bound to produce materialism and “meanness.” His experience during the past two centuries has taught him, if no one else, that trying to make it perfect, as according to the vision, for instance, of one of the most influential Jews in all history, Karl Marx, invariably causes rivers, torrents, oceans of blood to flow. Finally, in regard to our citation of Chesterton, some readers, especially younger ones, may not know what Bolshevism was. The Bolsheviks were the Marxist left wing of the Russian Social Democratic Party at the beginning of the 20th century. It was they who seized power in November, 1917, from the liberal democrats who had overthrown Russia’s Christian monarchy earlier that year. They turned Russia and the lands of her empire into the Union of Soviet Socialist Republics (USSR) and eventually became commonly known as Communists, clinging to their power until 1991. Such shame (and honesty) over the treatment of converts is seldom voiced by Jews. Hans Herzl was not unique. Other Jews who have converted to Christianity, not in its true form, but to one or another Protestant counterfeit of it, have also suffered. Some were named in a recent special issue, “Jewish/Christian Relations,” of the Evangelical news magazine World . The magazine told, for instance, of Charles Halff, who became a Baptist minister in San Antonio. In 1948 he began a radio program, The Christian Jew Hour , that still exists as Messianic Perspectives . When he converted, his family tried to have him declared insane. He was actually jailed for a time. Later the family offered him $85,000, a huge sum in the 1940s, to recant. He refused. Putting monetary value on religious belief and adherence to it, as if movements of the spirit can be materially quantified, is alien to the Christian view of what is right and of reality itself — reality, to us, being spiritual as well as material — but the precedent for it was set in the history of the Church with 30 pieces of silver. We have already seen in this article that Jewish converts to the One True Faith, far from receiving any kind of reward in this world, often learn immediately upon becoming Christian that Our Lord meant it, as with everything He says, when He warned that anyone wishing to follow Him will have to take up a cross. This is one reason, doubtless, why they were cherished perhaps more than other converts in the days when the Church still evangelized. It was a recognition that for their conversion they were not paid a price, but quite ordinarily paid one, and dearly. The price paid by Theodor Ratisbonne was the enmity of a brother. Theodor was born at the end of 1802 in Strasbourg of an Alsatian Jewish family that had grown wealthy in banking. He grew up amid great luxury. Such were his gifts that when still very young — he was merely 22 — he was chosen by the Jewish community of Strasbourg to replace its leader, Samson Libermann, when the latter converted to Catholicism. Ratisbonne and Samson Libermann were friends. Two other friends also converted when Libermann did. These conversions had a profound effect on Ratisbonne. He began a study of Holy Scripture and of Church history. Grace was working in him. His study (and grace) led to his being baptized in 1826 and then into the local seminary. He was ordained in 1830. He remained in Strasbourg as a priest for ten years, writing the first of at least nine books on religious themes published in his lifetime. He moved to Paris in 1840. “Everything” also included Theodor. Obviously it infuriated Alphonse to have anybody close to him taking the “superstition” of religion seriously, especially the “superstition” of Catholicism. However, on January 20, 1842, on his way to the Near East, in the Church of Sant’Andrea delle Fratte in Rome, the Blessed Virgin Mary appeared to him. She did not seem to appear. He did not merely think she appeared. She appeared. The fact was formally confirmed by Pope Gregory XVI following a canonical inquiry. Sant’Andrea delle Fratte is not one of Rome’s great churches. It is a simple parish church just up the street from the Spanish Steps. Of the three pilgrim’s guidebooks to Rome owned by the present writer, the church is not mentioned in two. The third mentions it, but that is all. No visit is recommended. Yet, no church in Rome built before the 20th century will be totally bereft of treasure, or history. In the case of Sant’Andrea delle Fratte, the chief treasure is two marble angels carved by Bernini, two of the celebrated series fashioned by his studio for the Ponte Sant’Angelo. They stand by the high altar. As for history, anyone enamored of Scotland when the country was still Catholic will be interested that this church dedicated to St. Andrew served as the Scottish national church in the capital of Christianity prior to the so-called Reformation. Music-lovers will care to know that Alessandro Scarlatti, the composer, was married in the church in 1678. For a reason that will be evident in a few moments, if it cannot already be guessed, it is also where St. Maximilian Kolbe chose to celebrate his first Mass on the day after his ordination in 1918. Since there is nothing truly remarkable about Sant’Andrea delle Fratte for the mere tourist, it will be wondered what Alphonse Ratisbonne, enemy of everything Catholic, was doing there on January 20, 1842. Was he looking for shade on a hot day? Not in January. Did he wish to rest somewhere quiet after much walking in the streets? Actually, he was accompanying a friend. The friend was making arrangements for a funeral and asked him to wait while he did so. It was during the friend’s absence that Our Lady appeared. This, we may be sure, was the true reason why Ratisbonne entered the church, though he did not know it. Our Lady was waiting for him. There is no reason for us to describe her appearance at length. Ratisbonne’s own account of the event is given in a book that used to be famous, fell out of print for more than a century, but is again available, Conversion of Ratisbonne (Roman Catholic Books, Fort Collins, CO). All that needs to be known here is that on January 20, 1842, Ratisbonne was wearing the Miraculous Medal. This was at the request of the very friend he accompanied that day. He had agreed to wear the medal in order to prove it would not affect him in any way, let alone bring about his conversion. It ought almost to go without saying that it was as we see her on the Miraculous Medal that Our Lady appeared to Alphonse Ratisbonne. What is most important is that his conversion took place on the spot. Apart from the fact that Gregory XVI confirmed the apparition and pronounced Ratisbonne’s conversion “miraculous,” there is no reason for us to question what happened to him simply because it was instantaneous. Road-to-Damascus conversions are rare, but there have been others. That it was so with Alphonse Ratisbonne was additionally attested by the immediate change in his behavior. By the very next year, 1843, he had joined his brother in founding an order, the Sisterhood of Our Lady of Sion, the purpose of which was the Christian education of Jewish boys and girls and whose first members were two Jewish sisters converted by Theodor. Over the years, a number of houses under the patronage of Our Lady of Sion would be opened by Theodor in France. Meantime, Alphonse was ordained a priest in 1847. Soon after, he entered the Society of Jesus. Deciding, however, that he wished to devote his life to the evangelization of Jews, he left the Jesuits. His departure from the Society required papal approbation. Bl. Pope Pius IX gave his readily. Pius’s predecessor, Pope Gregory XVI, had earlier approved Theodor’s intention to spend himself in the conversion of Jews. That is when Theodor began opening Houses of Our Lady of Sion. Several of his books, notably Questions Juives in 1865 and Reponse aux Questions d’un Israelite de Notre Temps in 1878, were written as aids for his work of evangelization. Alphonse moved to the Holy Land. That was in 1855. He took some of the Sisters of Sion with him and in 1856 built for them a convent, the Convent of Ecce Homo, in Jerusalem. (The convent was so named because it was built on the site, according to local tradition, where the residence of Pontius Pilate stood.) Four years later he built another convent nearby, the Convent of St. John. An orphanage and school for Jewish girls was part of each convent. Later, Alphonse and a few companions formed a religious association, the Fathers of Sion, for the conversion of Jews (and Mohammedans). He continued at his labors until his death in Jerusalem in May, 1884. His brother Theodor had died in Paris five months earlier. Our account of the lives and work of these two men has been pretty cut-and-dry. Anyone, however, who has ever looked at a few apologetical works of the era, at least ones touching on the evangelization of Jews, will know simply from the number of references to Maria Alphonse and Maria Theodor Ratisbonne that the effects of the two brothers’ labors were far-reaching. Also, they enjoyed the support and patronage of three successive popes, Gregory XVI, Bl. Pius IX and Leo XIII. The brothers had numerous honors and promotions bestowed on them by these same pontiffs. When Theodor died, he received the Last Sacraments from the Archbishop of Paris, who also imparted the blessing of Pope Leo XIII. Doubtless, had the Church not stopped seeking converts forty years ago, the Ratisbonne brothers would not be as forgotten today as they are. There might very well be somebody working for their canonization. As it is, we should not be surprised by the marks of respect and high regard received by them from the popes of their day. We have said the Church cherished her Jewish converts. Of course, all of her converts were cherished, but there does seem to have been a special feeling for the Jewish ones. How could there not be? Apart from the sacrifices commonly made by them — think of the wealth and positions left behind by the Ratisbonnes — the Church was bound to remember that her very first members were twelve Jewish converts. The Congregation of Our Lady of Sion does still exist with small communities of sisters in 21 countries and four houses of contemplation in three, France, Brazil and Israel, but there is no talk today from the sisters, or the affiliated priests who are located in the same countries as the houses of contemplation, about converting anyone. How could there be? Now the sisters “work towards the fulfillment of the promises of justice and peace which were proclaimed by the prophets for all of humankind.” That is according to one of their websites. The aims of the evangelical labors of Ven. Fr. Francois Marie Libermann as he first undertook them have proved more lasting than those of the Ratisbonne brothers. But, then, his missionary zeal was turned in another direction — not toward the eldest sons and daughters of Abraham, but toward the children of black Africa. The Church has not renounced her right to care for the latter, and even to oversee the increase of their number. Indeed, she seems increasingly to see in them her own future. She is probably correct to do so. In decline for decades in Western Europe, and now possibly facing actual as well as moral bankruptcy in North America, where can she find a future, perhaps for centuries to come, if not black Africa, Latin America, some lands of Asia (Korea looks promising; the Philippines have been Catholic for a long time), and Oceania? Who can say, perhaps Catholic peoples from Third-World lands will rescue the Faith in the North, reviving it in Europe and making it finally come alive in the U.S., when they populate those places after the present majority inhabitants abort and contracept themselves out of existence. Did Ven. Fr. Francois Marie foresee the future he was preparing when he turned toward black Africa in his apostolic zeal? The Catholic knows there is no such thing as coincidence, but very few are aware, or can be without Heaven revealing it, how Providence is using them. Like the Ratisbonne brothers, Ven. Fr. Francois Marie hailed from Alsace, but his father was a rabbi, not a banker. Born in 1804, his life would not be very long. He died in Paris, in 1852, when still 47. He was the fifth of seven children and was given the name Jacob at his circumcision. “He was brought up according to the sternly strict tenets of the Talmud, and his mind was early imbued with a special horror of the ‘Goyim,’ or Christians,” says the old Catholic Encyclopedia with a candor that would be impossible in a Catholic reference work published today. Jacob’s father determined that the boy would succeed him as rabbi for the local Jewish community. Accordingly, he was sent for Talmudic studies to Metz, at that time still, as it had been in the days of Bossuet, the city in France with the greatest number of Jews living in it. Jacob was 20. He somehow came upon a copy of a new Hebrew translation of the New Testament. He read it, probably because his eldest brother converted to Catholicism at about this time. (This was Samson Libermann, of whom we have already heard.) Later, two other brothers converted. These conversions appalled Jacob, but he could not deny to himself that his brothers seemed happier and more at peace with themselves after their change in religion than they ever had been. Further, he was himself impressed by the New Testament when he read it. In 1838 Libermann was summoned to Rennes to serve as novice master for a community of Eudist Fathers, but he had already begun to form in his mind the shape of an apostolate to the Caribbean blacks. He refined the idea during the two years he worked in Rennes. In 1840 he traveled to Rome to seek the Holy See’s approval for the erection of a religious institute. While he waited for it, he wrote a commentary on the Gospel of St. John. At the end of a year, approval was given, and Libermann departed for Strasbourg, where he was ordained in September, 1841. The new order was to be called the Congregation of the Immaculate Heart of Mary, and Father Libermann opened a novitiate for it, near Strasbourg, the same month he was ordained. He had with him at first only one other priest and a sub-deacon. Other men soon followed, however, and then more and more. It was fortunate, as new missions kept being offered to the fledgling society — and not simply in the Caribbean. 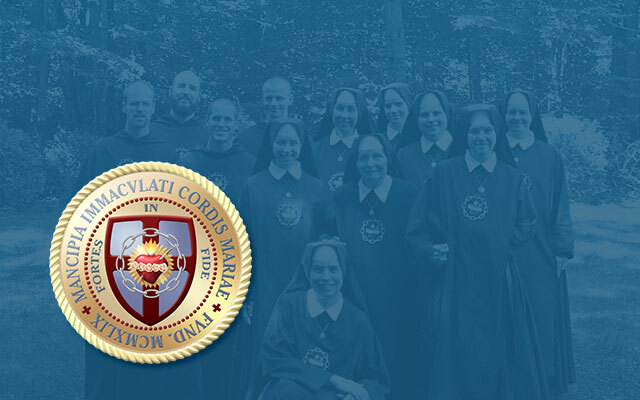 The Congregation of the Immaculate Heart of Mary existed as an independent order with Ven. Fr. Francois Marie at its head from 1841 to 1848, by which time it was flourishing. It was also then that the Holy See decided the order should be joined to another missionary one, the Congregation of the Holy Ghost. This latter society was formed in France early in the 18th century, had considerable success, but was all but wiped out by the Revolution. Under the leadership of Ven. Fr. Francois Marie the two orders were united with much less difficulty than might be supposed, ecclesiastics being as protective of turf as any government functionary. In effect, a wholly-new order was founded. Ven. Fr. Francois Marie continued as superior general of the Holy Ghost Fathers, as the new body came to be commonly called, until his death in 1852. Probably his best-known successor in that office followed 109 years later: Archbishop Marcel Lefebvre. Few religious societies founded before the 20th century remain as vigorous as the Holy Ghost Fathers, who now call themselves Spiritans, Holy Ghost as the name of the Third Person of the Holy Trinity having fallen out of use in the mainstream of the post-Vatican II Church. It was earlier said that before we were done here, we would turn to the subject of “anti-Semitism.” If that seemed to promise more than was meant, it is regrettable. The entirety of an essay of this length, let alone the space that remains until our conclusion, could not provide for anything approaching an extensive, let alone exhaustive, consideration of such a subject. All we are going to do here, in the space that remains, is consider certain features of what we have called “the life of the spirit” as reflected in many Jews, especially irreligious ones; why the Christian reaction to such Jews, when it is Christian, is held by Jews to be “anti-Semitic”; the fact there is seldom any Christian reaction anymore; and the consequences. To Lazare, we want to juxtapose some lines from Max I. Dimont, another Jewish writer, one who produced (back in the 60s and 70s) best-selling books intended for Jewish readers, books that were meant to inspire them with the idea of their greatness. His titles included: Jews, God and History ; The Indestructible Jews ; and The Jews in America . The explanation: “He could count on them. As one scholar so perceptively summed it up — ‘In Judaism, God turned to man and said, “Finish the work for me,” and man said, “I will.” In Christianity, man returns to God and says, “I cannot do it, finish the work for me,” and God says, “I will.”’ In essence, the Christians are unable to fulfill the task assigned man by God, and slough the job back to God via Jesus. In Judaism, man is willing to work to achieve God’s mission, even if the task at times seems as hopeless and absurd as that of Sisyphus. But whereas the task of the Greek Sisyphus is meaningless, that of the Jewish one is purposive. To grasp the importance to Jews of this survival, and to see why it is important to them, is vital to understanding two more things of concern to us as Catholics. The second thing we can understand, now that we see the importance to the Jew of his surviving in history as a Jew in order to fulfill his “manifest destiny”: why no act, from the Jewish point of view, can be more vilely “anti-Semitic” than the conversion of a Jew to Christianity. It really is “treason” — a going over to the side of a people, the Catholic faithful, who believe this world is imperfect and always will be; that there exists a supernatural brotherhood which transcends the purely natural links that make men alike in their humanity; that the supernatural brotherhood is formed by membership in the Supernatural Body of Christ which has Our Lord as its Head; that inasmuch as salvation can be found only in membership in the Body of Christ, and never in the fulfillment of any earthly “destiny,” membership is a necessity; and that therefore members of the Body of Christ, if they are to be true brothers to other men, are obliged to extend membership to those others, or to try to do so. Now, with Chesterton’s words still before us, let us ask ourselves a number of things. How many Christians living today have ever done anything to obstruct the “onward movement of the Revolution”? Do not most of today’s Christians, in fact, adhere to the central tenet of the false philosophy of liberalism whose political expression is the Revolution: that men may and even should live according to their own will instead of God’s, as if He did not exist, as if it really is for them to “achieve God’s mission”? Do they not further reveal to us their real thinking when the abstraction “man” falls from their lips as easily as it flowed from the pens of the revolutionaries who wrote the Declaration of the Rights of Man ? Ask the average Christian what he thinks all men, as members of society, should aspire to seeing realized in the life of society. Is he not likely to answer, “brotherhood” (in addition to freedom and equality, of course)? Ask him how that brotherhood is to be brought about. Will he not answer that what we must do is “get along” — i.e., practice tolerance, not in the sense of enduring what we must, but in the sense of ignoring differences, beginning and ending with any difference in ourselves, anything that would, if given expression, distinguish the remaining Christians from the rest of society as it has become? In a word, are not Christians less Christian than once they were? As we have become less Christian, have we not become more Zionist, more (as Dimont puts it) symbolically “Jewish”? Is not our “Jewishness” revealed most tellingly by our refusal to try any longer to evangelize Jews? How evangelize them anyway? Convert them to what? An attenuated version of themselves? To the degree we have become like them — that is, to the degree that we have let our Christianity be subsumed in “Jewishness” — have we not surrendered to them and the dream they have of fulfilling their “manifest destiny”? Is their dream not become ours? Is it not this surrender which gives them their power over us? If the West today is full of men who persist in calling themselves Christian but who are really as materialistic and mean as any Zionist, tomorrow looks worse. That is because, however subservient Christians have become, the Zionists cannot be sure that some number of us will not yet find the spiritual resources to revolt. That is why they are always ratcheting up their demands. It was not enough for Pius XII to shelter Jews. He was supposed to “speak out.” In the same way, it was not enough for Christians to tolerate other religions, in the true sense of tolerate. They had to agree to declare that all religions are equal in the state, and then that there should be a wall between religion and the state (except for the religion that seeks the same “universal brotherhood” whose attainment is now supposed to be the object of all political endeavor). In the same way, it was not enough for Christians to honor Judaism as the vine of which we are a mere branch. We had to renounce all efforts to evangelize Jews. Well, the ratchet can go up only one more notch. That is for the Faith simply to cease to exist. Then there can be some certainty that no one will find the spiritual resources even to resist Zionist “manifest destiny,” let alone revolt against it. How avert this worst of all possible disasters, the Faith ceasing to exist? True enough. The Church has a mandate for eternity. It does not follow, however, that those who have refused for 2,000 years to believe that will stop wishing her dead or seeking her demise — except they convert. Further, the Church can cease to be a force in the lives of most men, cease to the degree that few will find in her the resources for any kind of action. She can cease to be that when most no longer see a need for her, and that can happen if the need for her is no longer taught. And has not this point very nearly been reached? Does today’s conversion rate reflect much felt need? Is there a single bishop anywhere in the world, even one, who still openly teaches that outside the Church there is no salvation, or who teaches it without quickly adding, “but85”? As for the laity, how many still believe what needs to be believed? There are some, but what happens when they make it known? Are they not condemned by all the others as “intolerant,” as violating the sacred canons of “brotherhood,” as even being — if Jews are under discussion — “anti-Semitic”? So, yes, the Faith will not cease to exist. But how keep it from becoming totally irrelevant, how keep the Church alive in the lives of men? Clearly, the answer — part of it — is to show men that the Church is not merely one among many other forces for good in the world. They must be moved to see her as uniquely necessary to their own ultimate good, and that may be accomplished — it has been accomplished, the present writer can testify for himself — by ordinary Catholics speaking in terms the bishops do not teach for the time being. Then there are other things to do. One of them is to see to it that the Ratisbonnes, the Libermanns, David Paul Drach, Ludwig and Jenny Loeb — and many other converts who were unmentioned here — will not be allowed to remain forgotten.